The CyberKnife® System is the first and only robotic radiosurgery system designed specifically as a non-invasive treatment for cancerous and non-cancerous tumors throughout the body. Though its name may conjure up images of scalpels, the CyberKnife® Robotic Radiosurgery System involves no invasive tools. 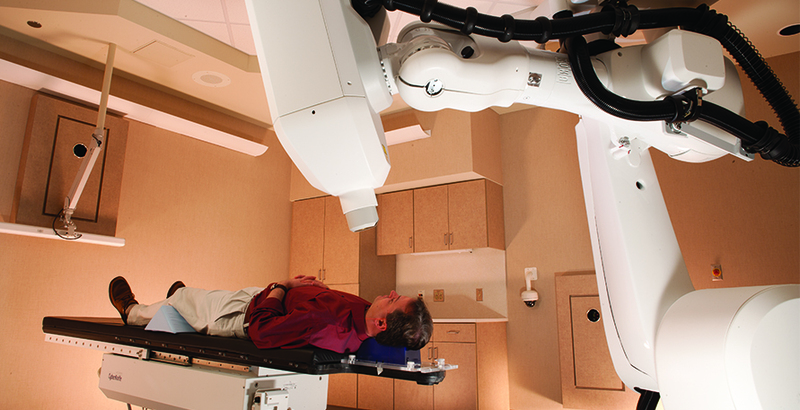 The CyberKnife® System is composed of a radiation delivery device called a linear accelerator, which is mounted on a robotic arm. This arm enables the system to deliver radiation to tumors virtually anywhere in the body, including the brain, head and neck, spine, lung, prostate, liver, pancreas, breast and other soft tissues. The CyberKnife® System’s sophisticated software and advanced imaging tracks tumor and patient movement, adjusting the radiation to ensure treatment is delivered with a high degree of accuracy. Because of the stability provided by this exceptional tracking, CyberKnife® eliminates the need for patients to have their heads stabilized or their breathing limited during treatment. With the CyberKnife® System, patients can complete treatment in one to five days, compared to the weeks it takes to complete conventional radiation therapy. In addition, it provides a pain-free, non-surgical option for patients who have inoperable or surgically complex tumors. St. John Medical Center was the first to bring CyberKnife® technology to Northeastern Oklahoma. Our CyberKnife® team is the most experienced in the area, and we are pleased to work closely with your primary care physician to ensure the best care. For more information, please call the St. John CyberKnife® department at 918-744-2777.